Communist North Korea long has been a threat to world stability, with its parades of military weaponry, nuclear capabilities and its promises of destruction and death for its foes. That rhetoric has surged in recent months, with dictator Kim Jong-un warning he would rain “nuclear thunder” down on the United States. But none of that should be a surprise, according to Breaking Israel News, which reports a highly respected rabbi predicted in 1994 that the biggest threat to Israel would come not from the Muslim-dominated nations of Syria, Iran or Iraq, but from North Korea. “North Korea has only recently emerged as a major threat to the Western world, but a noted kabbalist predicted 22 years ago that the rogue nation would become the nuclear key to the final war of Gog and Magog,” said features writer Adam Eliyahu Berkowitz, who lives in Israel. He recounts how Rabbi Levi Saadia Nachamani, who accurately had forecast both the Six Day War in 1967 and the Yom Kippur War in 1973, issued his warning. Joseph Farah’s newest book, “The Restitution of All Things,” expounds on what few authors dare to approach, the coming kingdom of God. Available at the WND Superstore. The clash between the repressive and closed North Korea and the U.S. has escalated under President Trump. For eight years under President Obama, North Korea’s threats were virtually ignored. But Trump, who has made it clear he believes North Korea and Kim are problems that need to be solved, is pressuring China, a Pyongyang ally, to force Kim to back down. Nevertheless, as Fox News reported, North Korea on Tuesday conducted a huge live-fire drill using hundreds of pieces of artillery. The U.S., meanwhile, dispatched a nuclear-powered submarine to join the fleet of ships it already has in or near the region. The USS Vinson aircraft carrier strike group was in the Philippine Sea near Japan. Breaking Israel News said Rabbi Nachmani’s prediction was shocking for many reasons. The news site noted that since its first nuclear test 10 years ago, North Korea’s weapons testing has increased in frequency and size. “North Korea will attack Seoul, the capital of South Korea, conquering it. It will become one nation, She’ol, under the rule of North Korea, which will then come to threaten Israel,” Breaking News Israel reported he said. VosizNeias, a site for Orthodox Jews, reported back in 2009 of the growing threat from North Korea, which had just set off its second nuclear explosion. “This development is a direct challenge to the leader of the world’s remaining superpower, Barack Obama, who proclaimed to his citizens: ‘I strongly condemn their actions. N. Korea’s actions endanger the people of Northeast Asia, they are a blatant violation of international law and they contradict N. Norea’s own prior commitments,” the report said at the time. The rabbi said there’s not going to be sudden peace, as some hope. WND reported this month on the huge celebration staged in North Korea on its founder’s 105th birthday. 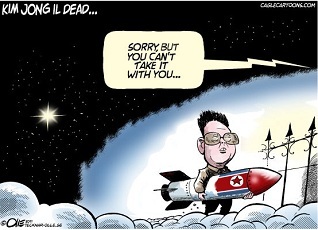 Then came the threats from Kim Jong-un, who has been known to execute his political enemies through military ordnance. Kim’s rhetoric about “nuclear thunder” followed Trump’s decision to allow the military to launch missiles against a Syrian airfield and to drop an 11-ton bomb on an ISIS operation in Afghanistan. “We’ll be conducting more missile tests on a weekly, monthly and yearly basis,” the report quoted Han Song-Ryol saying. He charged that it is “crystal clear” that President Trump is “hell bent” on prompting a war with North Korea. Several experts say the U.S. should not ignore the possibility of a serious threat from North Korea. WND has been reporting on the threat to America from an EMP, the electromagnetic pulse from a nuclear explosion high in the sky, since early in the 2000s when former CIA chief James Wooley, former Defense Department staffer F. Michael Maloof and former Congressional EMP Commission member Peter Vincent Pry were sounding the alarm. Pry has told WND he’s concerned that two satellites North Korea has orbiting in paths that cross above America could have nuclear warheads aboard. Pry is executive director of the Task Force on National and Homeland Security, director of the U.S. Nuclear Strategy Forum. He served on the congressional EMP Commission as well as the Congressional Strategic Posture Commission. “All of us,” he said, referring to a team of experts in the field, “have written we think that the threat, the possibility of a super-EMP warhead is so great, the United States should take them [North Korea’s satellites] down,” he told WND. “We ought not tolerate them orbiting,” he said, because nobody knows for sure what’s on the satellites. The problem is that a significant EMP attack properly carried out in the skies over the United States could take down the nation’s entire electronic infrastructure, including computers, networks, communications and systems that provide fuel, electricity, food, banking and health care. The estimates range widely, but there easily could be multiple tens of millions of fatalities across the U.S. following such an attack. “The dark ages can come back … literally. … It’s that stark: A cliff waiting for us to fall over,” he said. The EMP threat, he said, is the one way in which a rogue nation like North Korea could inflict horrible damage on the U.S., possibly even neutralize it. After all, if the electronic controls were gone, would it even be possible for the nation to respond to an attack militarily?